I had been feeling awfully lazy to get back to work after two days of bliss-full rest(since i had taken ill...poor hubby(psst let's call him "AJ" for short..!!) really looked after me like i was a baby... and i enjoyed all that attention) but today was back to reality day...so i had to get going...After somehow pushing through the morning.....i lazily grabbed the door of the refrigerator at about 3 in the afternoon,soon as my daughter fell asleep, thinking god knows how much small leftovers the fridge is filled with..lemme first get them and do something about it i calculated y moves,but when i opened the refrigerator...since i kind of have the habit of checking on the expiry dates of an assortment of different bottles with mayo,cheese spreads, sauces etc, etc which are my co-sis's favorites, for take away's. (She needs to leave home at 6:30am since her office is a good 1hr or so..;). I happened to come past a bottle of peanut butter which i had brought about 2-3 months back to be introduced to my little one so i could get more proteins into her..;) as always for any mother how much ever your child eats it's kind of less or just not enough to fill your heart...;). There are many health benefits also of peanut butter here are some just to name a few: Peanut butter may protect against a high risk of cardiovascular disease due to high levels of monounsaturated fats and resveratrol; butter prepared with the skin of the peanuts has a greater level of resveratrol and other health-aiding agents. Peanut butter (and peanuts) provide protein, vitamins B3 and E, magnesium, folate, dietary fiber, arginine, and high levels of the antioxidant p-coumaric acid. So coming back to the peanut butter i knew there was enough time but for me something which has not been used for 2 months had no guarantee will be used in the near future..!! 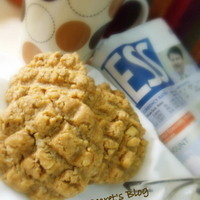 So i decided to make way for it...and suddenly something striked me, AJ had been asking me a few days back if there were some cookies or something to munch when he came back from work...well what was i waiting for...i set out to make cookies...but since he is not very fond of all purpose flour or Maida i decided to settle for oatmeal as a substitute... the obvious optional choice is wheat flour but since i had used wheat flour in my Carrots &amp; Orange Muffins recipe i decided to go with the oatmeal option..!! I ended up with lovely looking absolutely soft &amp; crumbly cookies...in just 10 minutes..;) &amp; AJ ended up gulping down at least 3-4 one after the other, he just couldn't stop himself..did feel happy...well loadz of happy happpyyy...!!! 1 Cup - Peanut Butter( Creamy or Crunchy your choice/ i used the latter). 1 Cup - Quick cooking Oatmeal(Quaker's oats is what i used). 1 Cup - Sugar( of your choice sugar free, white or brown). 1 Tsp - Baking Powder. Combine all the ingredients together in a large mixing bowl, mix well to form a dough,Set aside for about 5 minutes as standing time so the oatmeal can really soften well. Psst: you may find the dough a bit sticky but it's perfectly okay, if your not comfortable help yourself with a tablespoon of wheat flour to make it more dry. Roll dough into 1" balls and press with palm for desired shape, i pressed the back of a spoon to form the criss-cross shape on the cookie, you could even use cookie moulds for desired shape. Preheat oven for 10 minutes @ 350 degree . Place cookies on a tray lined with parchment paper or cookie sheet, or if your not using a microwave oven you could safely even use a foil sheet on a tray, grease it with butter and place the cookies on it. Allow to bake for 8 - 10 minutes. Cool recipe, Shruthi! Adding it to my Try Soon folder. Thanks for visting my recipe john...;) Really Appreciate you adding my recipe to the Try Soon folder....do let me know on how it turned out...!